When an amino acid (AA) is incorporated into a polypeptide, the charges on the amino and carboxyl groups disappear. Among the 20 common amino acids, five have a side chain which can be charged. At pH=7, two are negative charged: aspartic acid (Asp, D) and glutamic acid (Glu, E) (acidic side chains), and three are positive charged: lysine (Lys, K), arginine (Arg, R) and histidine (His, H) (basic side chains). The charge on the amino acid side chain depends on the pK of the AA (Table 1) and on the pH of the solution. At a pH superior to their pK (Table 2), the carboxylic side chains lose an H+ ion (proton) and are negative charged. They are therefore acid. At a pH inferior to their pK, the aspartic acid and glutamic acid side chains are uncharged. At a pH superior to their pK (Table 2), the amine side chains are uncharged. At a pH inferior to their pK, the lysine, arginine and histidine side chains accept an H+ ion (proton) and are positive charged. They are therefore basic. Table 1: pK of the amino acid side chain group. The pK of the side chain group is the pH at which exactly half of a carboxylic or amine group is charged. The arginine side chain is very basic because its positive charge is stabilized by resonance. The two nitrogens of the histidine side chain have a relatively weak affinity for an H+ and are only partly positive at neutral pH. Table 2: Charge of the amino acid side chains. Only the side chains are shown. At pH=7, side chains of the 5 amino acids are charged. Fifteen AA have uncharged side chains. They are: A, N, C, Q, G, I, L, M, F, P, S, T, W, Y, V.
Click here for Amino acid atoms nomenclature. 3 amino acids (arginine, lysine and tryptophan) have hydrogen donor atoms in their side chains. 2 amino acids (aspartic acid, glutamic acid) have hydrogen acceptor atoms in their side chain. 6 amino acids (asparagine, glutamine, histidine, serine, threonine and tyrosine) have both hydrogen donor and acceptor atoms in their side chains. 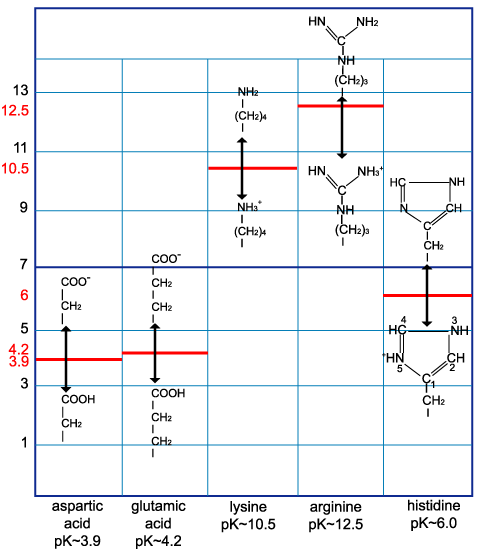 Table 3: Hydrogen donor and acceptor atoms in amino acid side chains. a Between parentheses, number of "sp hydrogens" that a donor atom can donate, if more than one. b Between parentheses, number of hydrogen bonds that an acceptor atom can accept, if more than one. 9 amino acids (alanine, cysteine, glycine, isoleucine, leucine, methionine, phenylalanine, proline, valine) have no hydrogen donor or acceptor atoms in their side chains. In the side chains of the first 5 amino acids (D, E, H, K, R), the atoms are charged. acidic: aspartic acid (Asp, D) and glutamic acid (Glu, E). basic: histidine (His, H), lysine (Lys, K) and arginine (Arg, R). are hydrophilic (or neutral, for histidine) and nearly always found on the outside of proteins. can be engaged in ionic bonds (through electrostatic attraction). -NH2 group: asparagine (Asn, N) and glutamine (Gln, Q). -OH group: serine (Ser, S), threonine (Thr, T) and tyrosine (Tyr, Y). are hydrophilic (Q, N) or neutral (S, T, Y) and are usually on the outside of proteins. are frequently engaged in hydrogen bonds. There are 10 nonpolar amino acids (including the tryptophan, despite an hydrogen donor atom): A, C, G, I, L, M, F, P, V, W.
tend to cluster their side chains together in the inside of proteins. are frequently engaged in Van der Waals interactions. Paired cysteines allow disulfide bonds.